There have been quite a few interesting submissions on the question request post. Today’s topic comes from an old batch but we hope to get to some of your newer questions soon. Do they have books or normal furniture? This definitely varies from district to district, and also varies among the different settlements. Possibly the hardest to answer. Books: the books listed below don’t include the standard collection of a typical Plain community family, including the Bible in German and English, German Hymnal books, and other Hymnals. My guess as to the more popular of the typical “English” books: Little House On The Prairie, Black Stallion, Lizzie Books (Written by an Amish lady, the writings have a similar style to Laura Ingalls), Lewis B. Miller Books, Janet Oke and other Christian Romance books. There are also popular weekly or monthly magazines, which vary including Birds & Blooms, Farm & Ranch, Plain Community Business Exchange, Outdoor Life, Hunting Magazines, and others. As for furniture, in most cases the furniture is pretty much the same in the smaller settlements, however in the larger settlements it may vary more from district to district. Here in our settlement, typical furniture that is found in the local furniture shops can be found in the houses. In the Southern Lancaster County area, they frown upon the overstuffed recliners, couches and other designer décor. Typical Plain community furniture is actually made in the local furniture shops. Of course you need a table with about 10 table leafs, 6 or 8 Chairs, rockers, plus benches, china cabinets, desks, and cedar chests. As John observes, answers to these two questions will vary. What other books or furniture would you add to John’s lists? John Stoltzfus is a father of five and member of a Pennsylvania Old Order Amish community. John works in product design for a local farm supply company. In his spare time he creates computer-generated art, which you can view at Stoltzfus Digital Abstract Art or on Facebook. My son was attracted to the Amish because of their reading habits. He told us that some of his Amish friends have more extensive libraries than anyone else he knows. An interesting incident to relate: about 2 years ago, one of our distinguished professors at the University of Virginia published a book about the future of the church in the world, especially in America. He was looking at this from a historical/sociological point of view. A few months after the book came out, one of Ed’s friends from the community in Virginia, appeared in this professor’s office, hoping to catch him to discuss some of the points in his book. This young man didn’t find the professor there, but his interest made a huge impression on these “academics”. It’s not often an OO Amish man seeks out a university professor to have a chat about a book of such universal import. Needless to say, they were very impressed! What plain books might you find in am Amish home for thier reading. The Martyrs’ Mirror is found in many homes. There is a large consignment auction in Parke County, Ind., every March. There is a large table of used books for sale in the back of the room near the baked goods. I just glanced as I walked by, and most looked like non-fiction. 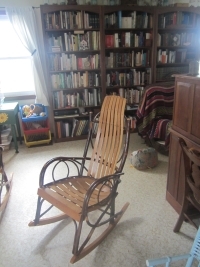 That’s a beautiful library with a comfy rocking chair to boot! I met a young Amish woman that was reading Janette Oke while running her farmers market. I’m an avid reader so it was an easy conversation piece. How often do the Amish read Amish fiction? When my mother-in-law told an Amish man that we both read Amish fiction he replied “It’s just fiction. Not much truth to it. Any way to make money and they’ll write it!” I do think this is true to some extent, but from many of the things I’ve learned and then inquired about, they have all been accurate (lottery system of Bishops, etc.). Well, my goodness. That’s inside Mark’s house. That’s Mark’s library nook. He has five bookcases of books in that nook and another closet full in an upstairs bedroom. In the cold weather that’s where Mark spends his evenings. Warm weather he’s out on his screened in porch. There are two recliners there. One for Mark and one for one of his frequent visitors. Those bookshelves have an interesting story. They were a surprise sixtieth birthday present for Mark from his entire church. They had the church summer picnic on purpose the day after his birthday at the Amish home just across the road from him. When he came over for the picnic there was a special cake for him as well as these five bookshelves all awaiting him. Some of the men had made the bookcases, others made the shelves, others did the staining and finishing. It was all done as a labor of love. As one Amishman waid to Mark. “Well, Mark, you don’t have much family so the church, we’re your family and this is what a family would do for another family member on his sixtieth birthday.” After everybody had eaten all the men just toted the bookcases and shelves across the road to Mark’s house and set them up right then and there. These acts of Christian love are a primary reason that Mark joined the Amish and why I supported him in that decision. Some day I’ll have to tell you how the Amish supported us when Mark’s mom was parlyzed from cancer. Erik, I enjoyed this article very much as I’m a bookworm myself. I was thoroughly tickled to read Don Curtis’ comment stating the accompanying photo was from Mark’s house. Don, thanks for telling the lovely story of the bookcases. I am dying to hear about your wife and the Amish community. I think you might talk to Erik about making that story its own article on Amish America. Mark, I’m getting very covetous of your lovely home’s arrangements. I look forward to more photos shared by Erik. Thanks for that great story.. I love hearing of the wonderful acts the Amish do for one another. Thanks for the history behind the book nook, Don! What a wonderful birthday gift! How about The Old Farmer’s Almanac? Most of the Amish will have family geneaolgy books. I’m still saving up for an Amish rocker like Mark has—I have ample books, but need better bookcases (they’ll have to wait). Thanks, Don C., for another glimpse into the “Amish life” via your son. What a great story! And what a wonderful community, to have embraced Mark in such a warm, generous, inclusive way! I’ve heard how difficult it can be for “Englischers” to join the ranks of the Amish (and be truly “accepted”), but it sure is evident (by that birthday gift, celebration, etc.) that Mark found the right community! You must be so happy that he has! Erik, how do the Amish acquire their books? You worked as an itinerant bookseller to the Amish, correct? Is that still a common way for the Amish to buy books, and if so, are they limited to just the selections in the salesman’s catalog, or can they basically order any book they want? Nowadays we order more and more books online, although I still love a stroll through the Barnes and Noble where they still exist. Will Amish communities be the last holdouts for brick-and-mortar bookstores? And is there some offline way for an Amish person who does not go online to order some obscure title of the type we would first look to Amazon.com for? @Ed…I have visited in the past a little with Erik about our common experience of selling books for the Southwestern Publishing Company. Both Erik & I sold books for Southwestern; though I think he did it for several, several summers while I only did it for one summer. I can assure you that a whole bunch of summers elapsed between when I did it and when he did, so things may have changed in the interim. Briefly; SWPC is a company based out of Nashville, TN that uses college students to sell books door to door. It was actually founded during the Civil War to publish books, especially Bibles, for the Confederacy as there had been no publishing houses in the South prior to the war. The part about using college students to sell for them obviously came along much later. When I sold for them there were two divisions: one selling educational aides, which were generally secular books and the original division selling Bibles and other Christian study aides. I worked for the educational division. I think Erik sold for the Christian/Bible division, but I am not certain of this. The student salesmen often parked their car and made a loop back to it; carrying their sample books in a large plastic case that in my day looked a lot like a battery box. Which prompted: “Why are you walking around the neighborhood carrying a car battery box?” Turns out that was a good conversation starter. We only had about 3 or 4 sets of books to choose from and you only carried one or two books from each set, due to their weight & limited room in your case. There really was no catalog to order from. Things may have changed though by the time Erik came along a good quarter of a century, or more, after I sold for them. I have no idea how Amish folks would find the books that they wish to read / acquire otherwise, but I think this MIGHT have been how Erik began his interest in “the Amish”. He apparently ran across some in his territory and sold to them. At least that is my limited understanding of how it came about. At any rate, I have long since lost contact with Southwestern. I did hear several years ago that they had sold the original part of the their company … the Bible division. I have no idea if this is true, if so who bought it or how the new company markets their products i.e. if they still sell door to door or not. Personally, I think it is a little sad if they really did sell that division. Old kat, thanks for that description. Sounds like you had some fun summers selling books. How do Amish buy books? Ed as to how Amish get books, outside of Amish-owned bookstores in their communities, there are mail order opportunities (ads for individual books in places like the Budget, or catalogs in say Raber’s Almanac). Some buy books at sales and auctions. I also took an Amish friend by Barnes and Noble for a book run while up in PA (he left with a two or three-bagful haul). To follow up on what Oldkat has commented, there is no longer a Bible division at Southwestern, though there were still Bible-related products such as the Family Bible Library I sold in Amish communities as of a few years ago. Not sure if those are even available today, the offerings are more conventional educational books, study guides and books for children, also software/web-based aids. In 2007 I began subscribing to The Budget. Saw the “Information Please” column and began responding to queries about books after searching for the books on Internet. I would write seekers telling prices/conditions/etc of books I found. Offered to use my credit card to buy the book & have it shipped to the seeker & they could repay me with check or money order after receipt. Set up a system that goes great guns today–I get 2-3 letters or phone calls (from their outside phones) a week. Some of original people are still with me. Types of books range from fiction of all types to religious studies to genealogies (very few of those since they are so expensive), cookbooks (lots of special ones like for people who have allergies to types of foods), gardening, natural remedies and so on. I have teachers who write each year or more often to rebuild their classroom collections (often old, established fiction and nonfiction books from decades ago). Old and New Order Amish, Mennonites–all readers of The Budget. I also got into providing sources for all sorts of other things sought from lamp wicks to parts of items to information on medical problems written for the layperson (I print those out and send them. How to build solar greenhouses. And article from OLD Popular Mechanics from 1970s on how to establish water power to have lights or other powered items for an Old Order Amish man in Missouri. Sources for seeds for special plants (more and more paper seed catalogs have been replaced with Internet websites). Quilt/crochet/knit patterns for several ladies. What’s fascinating is how info about my doing this type of this has spread all over N. America. From a few people in Ohio or PA who wrote or spoke to friends and relatives till I get contacts from Canada, Colorado, Florida, Texas–everywhere they live. For a people with limited phone use, they have an intelligence spreading system that boggles one’s mind. AND on top of it all, I have NEVER failed to receive payment for orders I have replaced. Plus, for other information, I never fail to get a thank you note!! The way the Amish do business is the way I like to do business. For instance, last week I talked to an Amish man in the Millersburg area of OH who owns a harness hardware business and ordered 4 specialty bits for my driving horses. I did not realize that the bits were actually made in China, and probably would not have bought them if I had. I received them yesterday and the quality is amazing, especially considering the price. What shocked me more than getting a quality built product with a made in China sticker on it though, was that when I ordered them I asked how he wanted me to pay. He said “Oh, I’ll drop an invoice in the box along with the bits. You can just mail a check to me WHEN YOU GET A CHANCE”. What a great service you offer to the Amish across the US, Elizabeth! I truly hope that bookstores stay in business. I am an avid reader and I often plan day trips to town that have new/used book stores. I prefer the independent stores rather than the chains, but that’s just me. Nothing like the touch and feel of a book to get lost in! Finally just catching up with some of these threads I missed while on the road. Great story Elizabeth, glad you shared it. What a neat business/set of relationships you have built, and I bet you never imagined it would grow to that extent. I am currently staying with Amish friends in PA and wasn’t able to prepare a post for today (my Kindle died on Saturday). Yesterday got hit with a bug (I was given Super Tonic– liquid mixture of garlic, horseradish, onion, hot pepper, and one other ingredient I forgot–and also Echinacea tea, today doing better). Will be checking in and back to regular posting in a couple of days. I think we all hope they’re taking very good care of you. Our community has been so sick. First influenza a, then the stomach bug, now strep throat. Hope you’re feeling better soon! with Erik. Aside from both of us selling books for Southwestern while we were in college: I am down with a bug this week, too. First time I have missed any work because of being sick in about 20 or 25 years. Hope you feel better soon Erik. Sorry to hear you’re not feeling well, Erik. Plus, you’re away from home. Nothing like tucking up in your own bed when you’re sick. Take care. Well, I asked Mark about the Amish buying books. He said that there are a number of bookstores that cater to the Amish that put out catalogs and sell mail-order the old fashioned way, an order form sent in with a check. Also, Mark said that just about any Amish community of any size at all will have a bookstore that specializes in books that the Amish like. Wasn’t quite sure where I could ask this but I was wondering if you could plan only one trip to Amish country would it be Ohio or Pennsylvania? What’s this best time of year to go also. Thank you for your help. If you want to avoid the tourist areas, I recommend Indiana in the mid-to-late summer. I just visited an Amish family and from her store I could see a bookcase filled with books. The only thing I could make out easily was a Webster’s dictionary. Erik has been away visiting Amish America, he caught a bug a little while ago and his electronic devices failed him. Thank you for telling me. I thought I had done something wrong. I hope Erik feels better soon. I will keep him in my thoughts and prayers. A lot of us miss him. I live in Iowa and have been looking for a Amish lumber mill or a Amish Community that makes lumber products. I am looking for wood. In Davis County, Bloomfield, Iowa, there are Beechy Sawmill, Gingerich Sawmill, Mast Sawmill, and Trickle Creek Sawmill. D & M Sawmill and Construction, Dennis Miller, Allamakee County, Waukon, Iowa. Nisleys Sawmill and Logging, Wayne County, Corydon, IA.